DEARBORN, MI (BRAIN)—Tom Demerly says the story of his Bikesport Michigan closing after 17 years in business is not one of doom and gloom, but rather of necessary and hard learned adaption that can provide important insights to other retailers. HYATTSVILLE, MD (BRAIN)—﻿Arrow Bicycle owners Chris Militello and Chris Davidson were recognized on Dec. 7 with the 2009 Hyattsville Volunteer Service Award for their commitment to community outreach and bicycle safety. 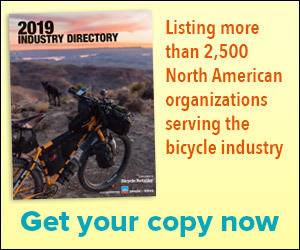 DEARBORN, MI (BRAIN)—Michigan retailer Bikesport, Inc. has closed its doors citing a long list of reasons including a reserve account imposed by its credit card processor that took $60,000 out of the store’s operating cash flow. DENVER, CO (BRAIN)—Bicycle Village has tapped Felt, Scott, Look, Cervélo and Gary Fisher to fill in the floor space opened up by the Colorado chain’s impending split with Specialized. CEDAR RAPIDS, IA (BRAIN)—Retailers throughout the Midwest are feeling the effects of a powerful storm that ripped through California and the West Coast on Monday. SCOTTSDALE, AZ (BRAIN)—Tribe Multisport, the valley’s largest bike shop focusing on Triathlon equipment and Multisport training, is relocating its 9,000 sq. ft. full service bike shop and training center. LOS GATOS, CA (BRAIN)—One of the biggest bike dealers on the West Coast is getting even bigger on December 12 when Mike’s Bikes opens the doors at their new store in Los Gatos, California, designed in partnership with Specialized Retail Services. BLOOMINGTON, MN (BRAIN)—The Hub Bicycle Co-Op in Minneapolis has contracted the QBP ReTale Program to design a bike-commuter store in the new University of Minnesota (U of M) Bike Center. SANTA ROSA, CA (BRAIN)—Santa Rosa's The Bike Peddler has opened its doors as a Specialized fixture rewards store. An official grand opening is schedule for this Saturday. AKRON, OH (BRAIN)—Given today's difficult economic climate, small business ownership represents a challenging endeavor for anyone, much less a young, untested entrepreneur. PHILADELPHIA, PA (BRAIN)—“Pedals Don’t Strike!” was the motto on Bicycle Therapy’s Web site this week as the Philadelphia shop tried to keep the momentum going from a small spike in sales and repairs last week following a six-day city transit strike that ended on Monday. DANA POINT, CA (BRAIN)—The instant Mike Mayefske saw the man pushing a $12,000 Pinarello Prince signature edition into Revo Cycles, he had a hunch. And his hunch proved correct. LONGMONT, CO (BRAIN)—Blue Sky Cycles in Longmont, Colorado, closed on Monday, a result of declining sales in light of the recession. ARLINGTON, VA (BRAIN)—Revolution Cycles is going to launch a unique "City Hub" concept store located at 220 Twentieth Street in the heart of Crystal City. Revolution Cycles City Hub is scheduled to open in the spring of 2010, coinciding with the tenth anniversary of the National Bike Summit on Capitol Hill. ARLINGTON, VA (BRAIN) —Freshbikes Franchising, LLC, a new company formed by two Conte’s Bicycle and Fitness franchise owners, will take over the entire Conte’s franchise system, the company announced on Monday. MADISON, WI (BRAIN)—Erikʼs Bike Shop is opening a new shop at 795 University Avenue, on the north side of the all-new University Square Building, located near Park Street and just north of the Kohl Center. FORT MYERS, FL (BRAIN)—Former Colombian BMX team member Al Herrera has opened E & A Bicycles in Fort Myers, Florida. Herrera previously owned cycling shops in Cali, Colombia. Since moving to the United States seven years ago, he has managed several cycling shops prior to launching E & A Bicycles. IRVINE, CA (BRAIN)—Irvine’s Sand Canyon Cyclery has a new owner and a new name: Irvine Bicycles. Owner Jim Manton sold the three-and-a-half year old shop on July 1 to a local investor, said shop manager Josh Peters. NEWBURY PARK, CA (BRAIN)—Debbe and Mike Simmons own five Bicycle Warehouse stores in the San Diego area, and they just celebrated the grand re-opening of their Pacific Beach location on Saturday, July 11.